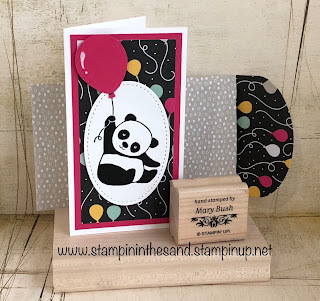 We will be creating this cute little note card, and it's coordinating envelope, during my Live at 5 Card Class today at 5pm (EST) on my Facebook Page). 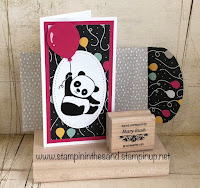 Be sure to tune in to see how to create the envelope and see how I stamped the inside of my card! You won't want to miss it! Speaking of my Live at 5 Card Class, on Tuesday we created a fun gift card/check/money holder! This card was Part 2 of my Party Panda Series. You can see the card in this post here. Place an order in my Online Store and use the current Live at 5 Hostess Code ( T9PPKRY2 ) and receive the supplies to create both the money holder card and this note card, by mail! *note: I am not allowed to send stamped images so you will need to stamp your own party panda!